Wooden steps are the finishing touch to any porch or deck, providing not just safe, easy access, but a touch of beauty. 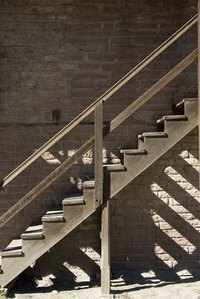 While easier to build than concrete stairs, there's a lot to know when building them. The basic terms are these: the rim joist, stringers, risers, run, and treads. The rim joist is base of a porch's wood structure and this is where you will connect your stairs to your porch. Stringers are the pieces of wood that run from the rim joist to the ground and they bear most of the weight. The riser is the vertical element of the stairway and refers to the height of the stairs and of each step. The run is the depth of the step. The tread is the top of the step. Attach a string to the porch floor and stretch it to a stake driven into the ground where you want the steps. The string should be level, not sloping. Measure the length of the string with a measuring tape to get the overall run (length) of the stairs. Measure down from the string to the base of the stake. This gives you the rise (height) of the steps. Divide the rise by the number of steps to determine the rise of each step. This number must be between 6 inches and 8 inches and all risers and treads must be uniform. Mark out the stairs on a 2-by-12 to make the stringers. Use a carpenter's square to draw your risers and treads onto the wood in pencil. Make sure each marked step is a right angle. Generally, you'll need one stringer per 18 inches inches of length. If you're steps will be 36 inches (3 feet), you'll need three stringers, one for each side and one in the middle. Cut out the stringer. Use a circular saw for the basic cuts and finish up with a handsaw inside corners. Cut out the rest of the stringers, using the first as a template, and then trim the thickness of one tread (about 1½ inch) at the bottom of each stringer so the rise of the bottom step will be equal with the other steps. Attach metal angle brackets to the porch rim joist. You'll need one per stringer, evenly spaced over the length of the steps and perpendicular to the ground. Position the angle brackets so that each stringer is about 1½ inch below the top of the porch floor. Use a hammer and joist-hanger nails to attach the stringers to the angle brackets. Cut the risers and treads to length, using the circular saw. Attach the risers to the vertical edges of the stringers, using 3-inch deck screws, and then attach the treads. Leave a 1- or 2-inch overhang at each outer stringer to create more attractive steps.